Compass plant (Silphium laciniatum), an icon of the tall grass prairie, is one of the first prairie species to disappear upon grazing (see Curtis quote at the end of this post). At Pleasant Valley Conservancy it was completely absent from the unrestored prairie remnants, even though many other prairie species (including such conservative species as Amorpha canescens; Sporobolus heterolepis; and Ceanothus americanus) were still present. When restoration began, compass plant was high on our priority list for reintroduction and it has been in all of our seed mixes for planting on all prairie or open savanana sites after they had been cleared and burned. However, it is slow to develop, and the first year all one usually sees is a single leaf. It continues to grow only vegetatively for the first few years, just making a large tap root. Although in favorable garden-like settings it can flower the second or third year after planting from seed, in most prairie restorations it takes at least five or six years to flower. 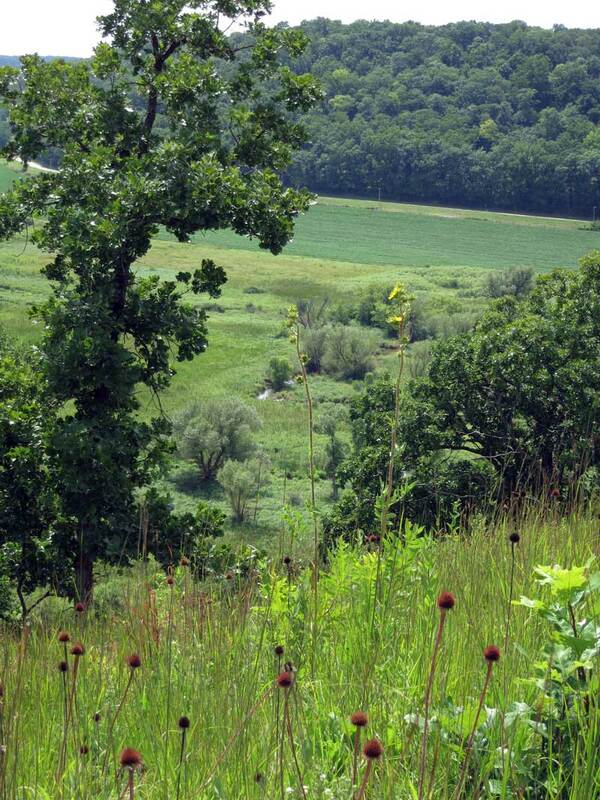 The first plantings at PVC were on November 1998 at the former ag field (future Toby’s Prairie) and at the recently cleared Overlook area (Unit 5A) on the South Slope. The Overlook area was planted again in April 1999 after burning. The first flowering plant at Toby’s Prairie was in 2004, six years later, but flowers were not seen at the Overlook until 2007 (nine years later). The Overlook has the appearance of a severe habitat, highly exposed, with a rocky soil and intense solar radiation. Despite this, flowering compass plants have continued to be present at the Overlook since it was first restored. In 2018 there were three tall flowering plants. As the table shows, we have been successful in getting compass plants established from seed at a wide variety of sites. It is now widespread at Pleasant Valley Conservancy, in various kinds of prairies as well as open savannas. Tall compass plant on the steep road bank. This is one of the driest parts of the site. Top of the South Slope by the Far Overlook. Now that compass plant is so well established, how long will it continue to thrive? The work of Frank Gould, one of Norman Fassetts students at UW-Madison, is pertinent. 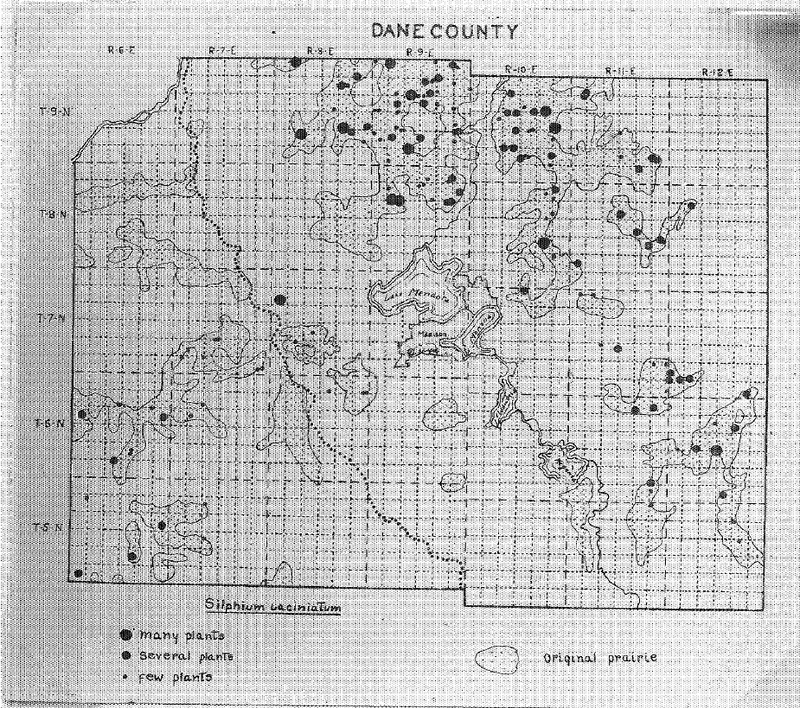 In 1936 Gould did an extensive survey of prairie remnants of Dane County, using the original surveyor’s prairie map as a guide. Although most of the original prairie was gone, he found remnants of it along roadsides, railroad tracks, “little-used pasture land”, and “wastelands”. Among other species, he recorded the presence of Silphium laciniatum in 156 localities, of which 150 “are within the bounds of the original prairie districts as outlined on the old [original surveyor’s] map.” See Gould’s map below. From Gould, Frank W. 1937. The present status of Dane County prairie flora. M.A. thesis, University of Wisconsin-Madison. See also Gould, Frank W. 1941. 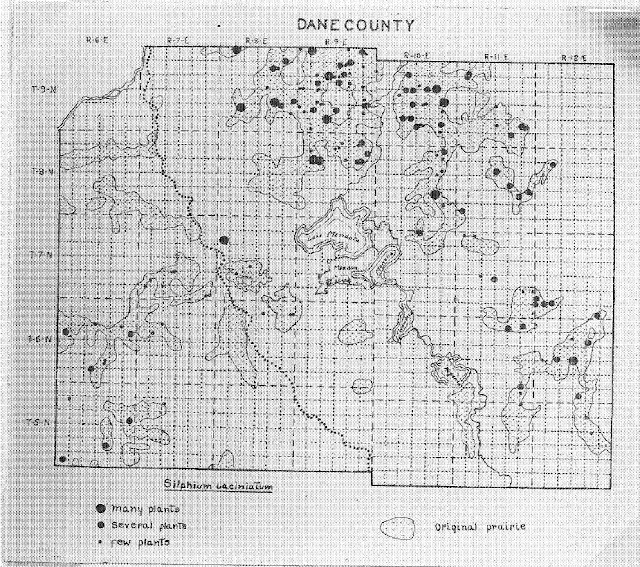 Plant indicators of original Wisconsin prairies. Ecology Volume 22: 427-429. The largest prairie area on Gould’s map is that north of Lake Mendota that was once known as the Empire Prairie. The outlines of this part of Gould’s map follow almost exactly my Empire Map done by GIS that was alsobased on the original surveyor’s map. It seems evident that compass plant has continued to thrive in the prairie areas where it had been present in 1836, when the original surveying was done. Thus, I conclude that as long as suitable remnant prairie habitat remains, compass plant will continue to thrive, but it is not able to move onto “new” ground, as so many other of the prairie plants are able to do. It especially suffers severely from grazing. 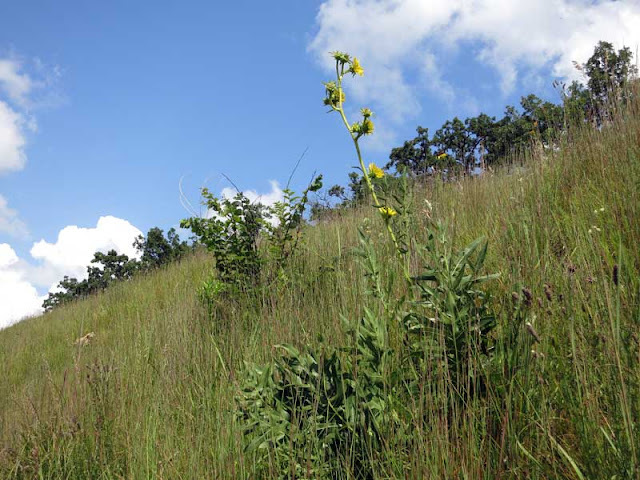 The South Slope bluff prairie is an interesting compass plant habitat. How can compass plant, a conservative mesic species with a “C” value of 8, do so well in this sort of habitat? Scanning the South Slope recently, I saw a compass plant 5 feet tall in the middle of what should have been the driest area. I looked further and saw a few more, almost as tall. I started counting and found at least two dozen compass plants, all in flower, and all looking very healthy, scattered across the slope. In retrospect, I should not have been surprised. When the NRCS Site Description team visited PVC in 2014, they showed me that the soil on our “rocky” slope was very deep. They were able to thrust a 7 foot long metal probe all the way to the hilt. This type of soil is called colluvium. 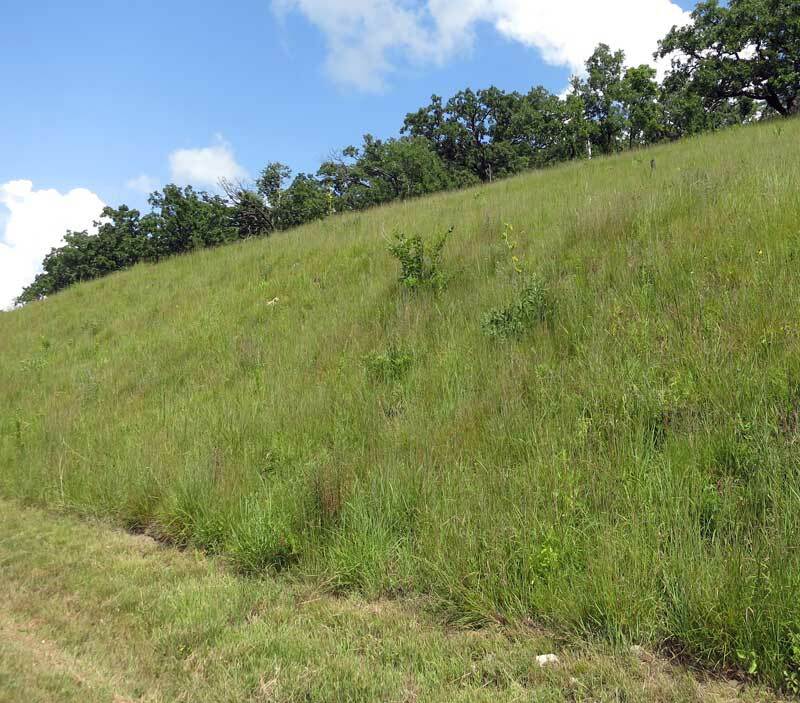 Although its surface is about 1/3 rock, the rest is exposed loamy soil quite suitable for deep-rooted prairie plants. If you want to see these bluff prairie plants, take a walk along the South Slope on Pleasant Valley Road from the driveway to County F.